A few years ago, Viktor Sabo got a burden to help jobless and unstable jobs with micro financing. Now, several receive loans that are paid back within 1-2 years. The results are promising. I am with Viktor Sabo at the fruit market in Subotica. He goes to Sale, a Roma man who moved with his family in Southern Serbia to Subotica in the North in 1995. Sale is in fruitsales. 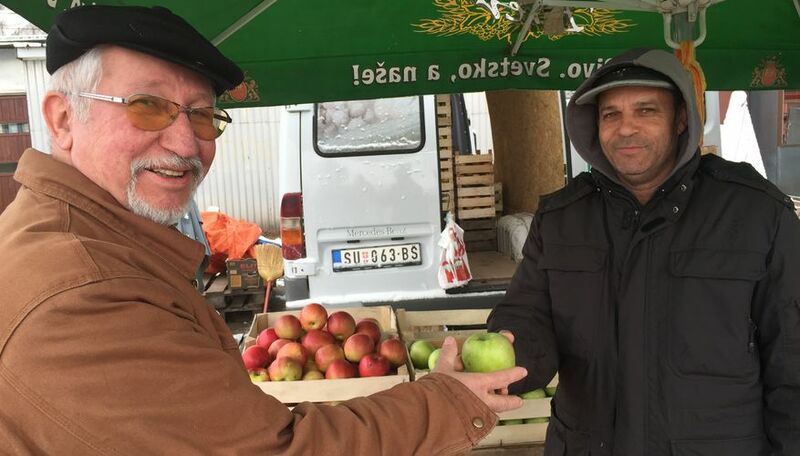 - We gave him a loan of 1500 Euros to buy a new van which was really needed for his fruit transportation. Now he is almost finished paying back, grins Viktor as he buys delicious apples from Sale today. Sale also sells tomatoes, strawberries and other kinds of fruits and vegetables, depending on the season. - Sale is a member in our Roma church in Subotica. We have 60 Roma members, and they are growing, says Viktor Sabo, who is the President of Christ Evangelical Church in Vojvodina, which is the Hungarian part of Serbia. -We have 18 churches in Vojvodina, says Viktor Sabo.